We stock an extensive range of RGB LED lights which are capable of producing highly vibrant, powerfully bright and superbly colourful lighting displays. Unlike the more traditional, incandescent light bulbs, coloured LED lights are incredibly energy efficient and they also last a lot longer. 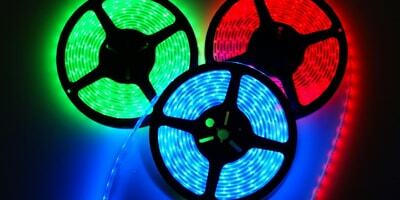 In most cases, LED coloured lights will last around 20 to 30 times longer than their more conventional counterparts. They also produce significantly lower amounts of heat and are safe for outdoor use. Our standard colour range includes red, green and blue LED lights, alongside a new choice of additional colours such as pink and purple. We also stock and supply a popular selection of LED colour changing bulbs which are completely programmable and suitable for use in any modern home or commercial environment. These highly advanced lighting products are easy to operate and can be controlled from the comfort of your chair, via a handy remote. We also stock a more conventional range of LED lighting products that are useful for more standard applications. Our white LED lights include cool white and warm white options which are dimmable and can be supplied with a selection of compatible bases, so there's no need to replace any existing fittings and fixtures in order to enjoy the benefits of these highly economical lighting products. Whether you are looking for a cost effective, low maintenance coloured lighting solution for the bedroom or living room, or you are in search of a practical alternative to traditional neon-based strip lights for the office, we can supply everything you'll need in order to create the perfect mood and atmosphere for you to relax and unwind in or to create a more comfortable and productive working environment. At Fibre Optic FX Ltd, we have been in the business of supplying high quality lighting accessories for several years and stock all of the best products at the lowest possible prices. Popular items include LED RGB strip light tape lamps, available in red, green, blue and white, 5050 RGB LED chips and an extensive range of LED wiring products which can be used to create your very own visually stunning coloured LED lighting features in any part of the home - both indoors and out. If you are looking for an LED lighting solution that can be used outdoors, then we also stock and supply a diverse range of waterproof LED lighting products and fixtures which are ideal for patio and garden lighting, or for lighting the driveway.